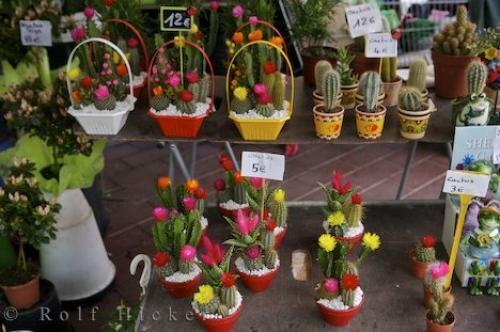 The Cours Saleya Market in Nice, France in Europe has a display of various types of flowering cacti. Cacti are extremely pretty when flowering and can be bought at the Cours Saleya street market in Nice, France in Europe. The Cours Saleya street market is one of the most popular markets in Nice, France where you can find a variety of goods like produce, vegetables, beautiful bouquets of flowers and many pots filled with flowering cacti. When cacti are flowering the colors of each cactus are very bright and vibrant and each basket is arranged so that the hues flow together and add life to any corner of your home. Cacti are fairly easy to grow and can tolerate neglect but if taken good care of they will thrive into strikingly beautiful plants. Photo of flowering cacti on display at the Cours Saleya Market in Nice, France in Europe. ... As a general rule, cacti do not like to be over watered, they love bright sunlight and they prefer to be slightly pot bound. While visiting Nice in France, Europe be sure to stop by the Cours Saleya street market for a few hours to see the collection of goods that are sold by the locals of Nice. The Cours Saleya market is packed with tourists on a daily basis and in the evening it turns into an exciting area full of an assortment of restaurants. Flowering cactus at the markets, Cours Saleya in the Old Town of Nice, Provence, Cote d'Azur, France, Europe. I photographed this photo with the digital SLR camera model Canon EOS-1Ds Mark II, aperture of f/4.0, exposure time of 1/60 sec. on ISO 100, as always I used a original Canon Lens, the focus lenght for this picture was 43mm.